Does stupidity make you racist? If you read the other FTBlogs (and you should), you may have noticed discussion of a study about cognitive ability, conservative ideology and outgroup prejudice. JT talked about it, and so did Jason. Basically, to read the coverage of the study, a team of psychologists from Brock University in Ontario have demonstrated that a lower level of cognitive ability is predictive of negative attitudes toward other races and gay people, but that political conservatism plays a significant role in that pathway. In a nutshell: conservatives are a bunch of hateful dummies, and now we can prove it! While I would certainly love for that to be the case, I have spent far too much time wading in the muck of junk science about racism to hop so readily on board. I can certainly confess to my own non-trivial amount of outgroup antipathy toward ideological conservatives. Knowing what I know about confirmation bias and the difficulties associated with measuring intelligence (and how those exact same problems have been used to justifiably discredit studies of scientific racism), I suppressed my “nanna nanna boo boo” instinct and actually took my skeptical scalpel to the paper. A link to the article, which may be behind a paywall for some of you, is provided here. Many of you will recognize this type of model from our discussion of confounding from a couple weeks ago. Basically, what they propose is that it is not stupidity per se that makes you racist – instead, stupid people gravitate toward authoritarian belief systems, which in turn leads them to hate outsiders. It certainly passes the ‘sniff test’ – conservatism has a marked affinity for simple, “common sense” explanations, and a pronounced aversion to things like nuance or complexity in argument. It makes sense that some of that would result from difficulty actually processing multifaceted arguments. This could result in a tendency toward system justifying behaviours, which result in racist ideology. 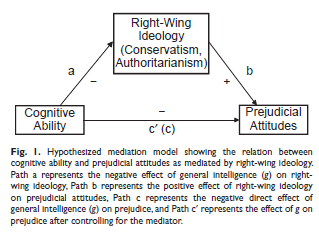 If the proposed model is valid, what we should see is that the connection between cognitive ability and prejudicial attitudes (“c” in the above diagram) should disappear when we ‘control’ for ideology. This means that most of the connection between brains and hate is explained by conservativism. In order to test their model, the authors conduct two tests. In the first experiment, they use longitudinal data from the U.K. that includes measures of cognitive ability, political ideology, and racial attitudes (as well as some important confounders). They analyzed these data according to the predictive model above, controlling for the socioeconomic status of cohort members and their parents (which helps control for childhood factors). In essence, they were able to capture data from thousands of Brits and test whether or not the findings conformed to their model. They undertook a statistical procedure called “path analysis” that, rather than loading all variables into the model at once, explicitly breaks out the effect of each potential confounder that might explain the connection between cognitive ability and prejudice. They were then able to examine authoritarianism independently from how many gay friends participants had. Path C is the association between cognitive ability and prejudice, and as you can see from the table, there is a significant correlation. However, take a look at the right-most column. 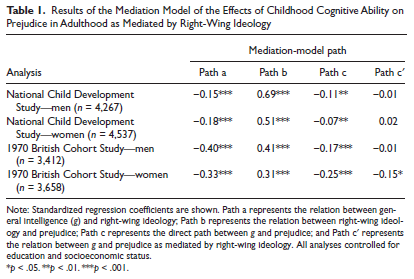 Path C’ represents the connection between cognitive ability and prejudice when ideology is controlled for. Remember the prediction above: if stupidity makes you conservative, and conservativism makes you racist, then the pathway C’ should disappear into non-significance. This is exactly what we observe in all but the final cohort (and even then, we see a moderating effect of controlling for ideology). 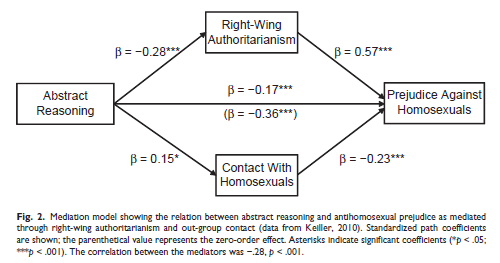 The data appear to support the hypothesis drawn by the authors: that people who are less able to grapple cognitively with complex and nuanced arguments will tend to form authoritarian/conservative worldviews, which in turn leads to out-group antipathy. As a result, when we think we see a causal line from stupidity to hate, what we are actually seeing is the indirect effect of a adopting bad (but cognitively easier) ideology. I don’t think that all conservatives are hateful, nor do I think they are all stupid. Certainly some intelligent people have articulated conservative positions, and some folks who have called themselves conservative have made great strides to promote equality. That being said, there is a foundational flaw in the conservative position – the fundamental attribution error wherein people deserve what they get and nuance is a vice. With that mindset, it’s hard to see group differences as anything other than a threat to one’s perceived position of superiority. All that being said, there are some pretty glaring omissions in this study that I think undermine the conclusions that the authors tried to draw from their findings. I will discuss some of those this afternoon. Related to your penultimate paragraph, I’ve always find it odd that conservatives are seen as being hardened and pragmatic while liberals are seen as being idealistic; and that along those same lines, liberalism is associated with youth and conservatism with age. I know with the latter this is a solid statistical correlation, but I still find it odd. For me, when I was younger, I held a number of conservative positions (more like libertarian, never socially conservative) out of a misguided idealism. To my young idealistic and naive self, it seemed like the law just ought to treat everyone exactly equally, that government should be limited to restricting parties from directly harming or cheating each other and stay out of most everything else (although I never at any time held to the radical belief that there shouldn’t be a basic social safety net, egads), that to go beyond that at all was an infringement of personal autonomy. As I got older, I started to realize the world was a helluva lot messier than that. I started to realize how, in some cases, nominally “equal” treatment in the face of past injustices was itself perpetuating those past injustices. I started to realize the ways in which true personal autonomy could be indirectly infringed by entities other than the government while still keeping within the bounds of the idealized version of law that I had; and conversely, the ways in which what nominally seemed like government intrusions into personal autonomy could in fact result in a net increase in true freedom by preventing those sorts of non-governmental indirect infringements. In short, I view a lot of the more progressive positions I ascribe as the sort of ugly, kludge-y compromises one must often make when dealing with the real world, rather than the sort of idealistic visionary stuff that is the popular perception of liberalism. For me, conservatism represents naive idealism, while progressivism represents a more jaded yet more realistic, more adult response to the problems we face. I guess I’m just weird like that. Between 20 and 30 I shifted waaaay to the left. Nice to see some commentary based on the actual study. I did some digging myself after seeing the LiveScience article but couldn’t find it. I look forward to your post this afternoon. Interestingly, they don’t measure IQ in this study, so the author of the linked post is tearing down a straw man. I question whether or not he actually read the article, or just what people were saying about it. I don’t think this is all of conservatism, (but it’s a pretty large chunk of it) but I do think that the causation is probably reversed. Negative out-group associative thinking results in conservative belief. There are various things that create this sort of thinking, exclusivist religion, racist or classist communities, etc. But I do think that the causation is probably reversed here. For what it’s worth the other chunk of conservatism I think is an honest belief that a “supply-side” society is truly the best for everybody. What makes the inversion of causation “probable”? You think that having conservative ideology leads to diminished cognitive ability by way of authoritarianism? I can’t think of a mechanism by which that phenomenon would occur. There is a difference between authoritarian conservatism (which is the kind discussed in this study) and libertarian conservatism (“supply side” and “free market” conservatism). The two things exist on different axes and have only recently been conflated to be the same thing. No, I generally think that in terms of how people tend to learn and evolve that the exclusion, the othering probably comes long before actual conservative political beliefs form, and not the other way around as I read the summary. So for the quote that you highlight it, I would change it to “negative out-group evaluations lead to the development of conservative ideology”. Although I could be reading too much into it, and it’s simply saying that the two are linked. Cognitive ability is something I think is a bit separate from any of these factors directly, although as I think that a significant portion of cognitive ability comes from “exercise” of said ability that communities in which said exercise is less common will result in reduced cognitive abilities, that yes, I can see how authoritarian community structures very well could impact cognitive ability. I wonder how many smart, educated people would have been racist 50 or 100 years ago compared to now. I suppose that depends on your definition of ‘racist’. If you’re using mine, I’d say roughly the same proportion as are now. This research aside I’d still have to say that stupidity may not make you a racist but it sure doesn’t help. There sure seems to be an overlap if you ask me!